A hard fought, close game and a last gasp win builds momentum for a club and the Lions a have been looking for the key to their form for the better part of the second half of the season. The win over Broadbeach in the Qualifying Final appears to have awoken the Lions as they completely blanketed the previously undefeated Labrador in the 2nd Semi Final to capture a second successive QAFL Grand Final berth for the Club. The talking points during the week centered around Captain Jesse Derrick, who had been cited for a dangerous tackle against Broadbeach and was subsequently suspended for 2 matches. PBC appealed the decision and were successful in having his sentence reduced to 1 match due to his exemplary playing record of well over 200 games and having never been suspended. Subsequently, Broadbeach have lodged an appeal on this which will be heard Wednesday 13th September. With momentum in hand and the rallying effect of the whole club getting behind their Captain and reigning Grogan Medallist, the stage was set for the Lions to produce their best game of the season and produce it they did. Right from the start, intense pressure on the ball carrier and relentless pursuit and the Tigers had no answers as the Lions picked up a handy early lead. From the outer many were awaiting the moment where the two time premiership winning Tigers would swing themselves back into the game but the Lions were ferocious and were not going to be denied. The lead increased marginally at each break and by the final siren the Lions had pulled off one the the best victories the Club has seen in recent memory. Liam McNeven was incredible in defence for the Lions, spoiling everything that came his way and running the ball out from defence. Jason Burge, in the midfield was again amongst the Lions best as he continued an outstanding season and one would suspect he would figure highly in this year’s Grogan Medal voting this coming Sunday. The tackling pressure was one the keys to victory and Tyler Cornish (6 tackles), Dylan Troutman (5), Jed Harrison (5) and Tom Thynne (5) lead the way in this department. Jackson Emblem, Jake Dignan and Jarryd Douglas were also prominent for the winning side. So, the Lions have done what no-one has been able to do all year and have won their place in the Grand Final and whilst they have the momentum, they will need to bring that same intensity and form to the Grand Final in the hope of securing the 2017 QAFL Premiership. Labrador and Broadbeach will fight it out this week in the Preliminary Final, where the winner will be the one to challenge the Lions in the Grand Final on Saturday 23 September at Southport. Unfortunately, the reserves weren’t able to secure their place on Grand Final day losing to ladder leaders Morningside. They will have a second chance this week as they take on Wilston Grange, who finished 4th during the regular season, in the Preliminary Final at Labrador. 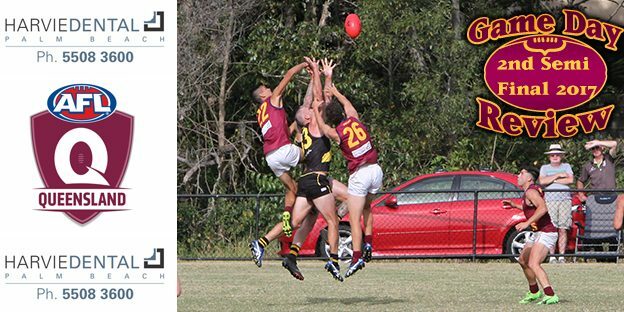 Sunday at Broadbeach saw the Colts continue their winning ways with a 14 point win over Broadbeach. They will also feature on Preliminary Final day as they fight it out with Western Magpies for a Grand Final berth. Wins in the Reserves and Colts this week would see the Club with all three teams in the Grand Final. Discussions this week suggest that this has not happened since 1973. Discipline and relentless pressure was exactly what set up the win on Saturday. From the very first bounce the intensity was at a very high level and all players were on the same page. We got back to what we do well and that was the basics of the game built on a platform of defensive pressure. The entire team accepted their individual roles and played team oriented football and made their teammates job easier. From that relentless pressure we were able to build our running game and moved the ball with good speed and control. On the scoreboard we won all 4 quarters which was another good sign of discipline and sticking to the plan. We have now earned the right to play off in the grand final in 2 weeks time against either Labrador or Broadbeach. Our focus switches to preparing the best we can and giving ourselves the best opportunity to achieve what we set out to do. This Saturday the colts and the reserves will play in the preliminary final to advanced to the grand final. It’s important we all get behind these teams. 3 teams 1 club so lets all get on board.. Disappointing loss but we get a second chance this week to earn the right to have a another crack at Morningside. We cracked in hard, in a tough and tight tussle for the first half. However we gave up a stupid goal through a lack of concentration right on half time to give them a 2 goal lead. The third quarter was the best footy we played all day. Our run and carry of the back line was excellent and we had all the momentum going into time on. Despite missing three shots on the run we had the game where we wanted. Then again through a lack of concentration, undiscipline and a lack of workrate, we conceded two late goals to hand back the momentum to Morningside. The last quarter was really disappointing. We had the chance to throw everything at them but a lack of belief allowed them to run out the game without a challenge from us. We have to realise how close we were in achieving a victory. A lot of things went against us that we had no control over but there were also a lot of things that didn’t go our way that we were directly accountable for. So back to the drawing board, all focus now to the Preliminary Final against Wilston Grange! Playing Broadbeach in the first Semi Final was going to be a touch battle physically and mentally for the Colts. This was the team that beat us in last year’s Grand Final by 2 points, 26 points in Round 2 and 3 points in Round 9 this season. But after showing great form beating Wilston Grange last week we knew that if they boys come out and play the style of football we know they can, we will walk away with the win. That’s exactly what they did. Having an injury concern over his ankle all week Dean Katsiris passed a tough physical Saturday morning to see if he could play. His run of the half backline lifted the team when he scored a goal half way through the first quarter. Jeremy Jago kicked the first goal of the day within the first 2 mins of the game. Broadbeach responded with two quick goals before Ben Stubbs and Lachlan Torpy both contributed to a 13 point first quarter lead. Arron Ashby and Hunter Hall provided the drive from the centre while down back Jimmy Cahill and Hayden Hoskins locked down Broadbeach forwards. Liam O’Brien kicked the first two goals of the second quarter with Dean adding his second for the day along with Torpy. Billy McAllister and Ioan Jones started using their strength around the contest while Tyson Schuener just took the ball and ran, provide great delivery to the forwards. Hunter Hughes was given a tagging role to Broadbeach’s fastest and most damaging player, and he did an exceptional job. Lachlan Blackmore continued his great form in the Ruck while Jeht Wollington was throwing himself into every contest. By the end of the second quarter we expanded our lead to 28 points. At half time, I encouraged the boys to continue pushing forward but be ready for Broadbeach to throw everything they had at us after the break. Throw everything at us is exactly what they did, kicking four goals to our two closing the gap to 14 points at the end of the third. Jeremy Jago went down with a knee injury and Jordan Burns coped a cork to his quad. Nick Person moved up forward when Jeremy went down and kick a goal while Torpy slotted his third for the day. At ¾ time, I just reassured the boys to keep playing our style of football which is a fast running game in the last quarter. Broadbeach keep coming at us but we had the answers to their pressure kicking 3 of our own in the last. Billy McAllister, Arron Ashby and Hunter Hughes all kicking a major in the last to close out the game winners by 14 points. Congratulation boys on the win. Now our focus is on Western Magpies next Saturday to claim our spot in the Grand Final.